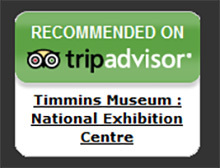 The professional staff at the Timmins Museum: NEC is happy to help you with your questions. Be aware that we do not have comprehensive employment rolls for any mine in the Porcupine area, and it is not very likely that we can readily find much information about people who were not well known. Nonetheless, we can sometimes find such things as the address of a person’s home, and, by inference, names of spouses and children and perhaps which of the more than 125 mines that person may have worked in during their time in Timmins. We regrettably cannot answer general questions about individuals (i.e. ”My grandfather, John Smith, came to the Porcupine sometime between 1915 and 1922 – what can you tell me about him? ); however, if you can provide accurate dates or other data we can sometimes find further information about individuals. Do not hesitate to ask! We can provide quick and accurate information about the history of Timmins, facts about the big three mines (Hollinger, McIntyre and Dome) and other smaller properties. The more specific your questions, the more likely we will be able to find an answer. Please note however that research takes time! The museum fields over 300 requests a year and we try to fill in the requests as time allows. Please note that we will not “do your project/homework”, but we will steer you in the right direction! The public is required to ask permission to use the Centre’s research resources. Researchers are required to identify their area of interest as well as why they are using the collection. A mutually agreeable time is established between the researcher and the Director/Curator to review the materials listed. Please be advised that some research material is stored in our collections reserve area and must be retrieved by museum staff; this is why we ask that the researcher advise us ahead of time (preferably one week) that they intend to use the museum. These requests are generally less time consuming to complete; costs usually involve photocopying ($0.25 per page) and postage. Please note that because of conservation concerns, not all materials may be photocopied. Individuals are encouraged to use the facility during weekdays; the research library is available on weekends to researchers by appointment only. The Timmins Museum holds over 20,000 photographs, negatives and transparencies in its collection. 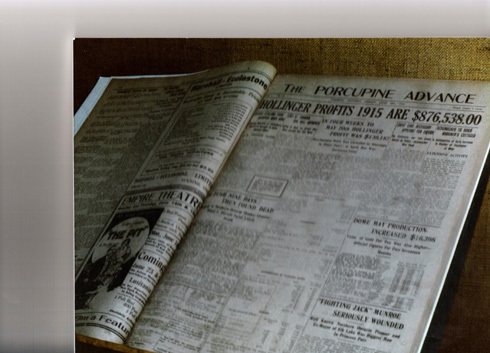 Photographs are available to view through our index, located in the museum library. Copies of photographs can be made for personal use at a cost of $25.00 for an 8 x 10 copy. Photos used in publications must acknowledge the centre as follows: “From the collection of the Timmins Museum: National Exhibition Centre”. Museum staff is responsible for the processing of all copies of photographs; original photographs are not lent out to researchers. Individuals or organizations may request that a museum staff member conduct research on their behalf; while simple requests are provided at no cost. Efforts requiring more than one hour of research time is subject to a fee of $50.00 per hour. The museum will always inform you of the time expected before we proceed with research that will result in billable time. Research requests must be made in writing; forms are available at the museum for simple information requests. Please allow one to three weeks for the completion of your request. Only pencils may be used in the research room; cell phones, cameras and scanners are prohibited. Lap top computers are permitted. Materials must not be marked in any way; tracing of documents is not permitted. Archival gloves will be provided to the researcher.